XYZ call for installations in unique places in the Terres de l'Ebre. Born from the will to generate a space for communication and experimentation between contemporary art and citizenship. Through interventions in the public space with large-scale works, the aim is also to value the natural, historical and cultural heritage of the territory. The different forms that this call may take will always depend on the place to be intervened and its characteristics. XYZ is located in spaces of great symbolic importance to which we add plastic proposals and / or conceptual discourse, initiating new views and dialogues regarding the territory, inhabitants and visitors. Thus XYZ, in the previous editions was developed, respectively in the urban space of the suspension bridge, in the natural space of the Trabucador beach and in the space of the historical heritage of the towers of Carrova and Campredó. 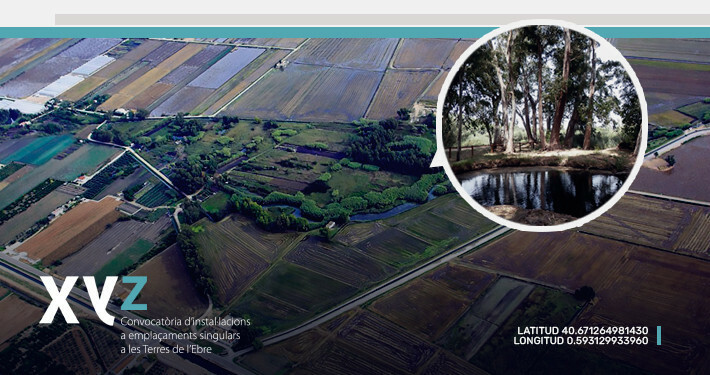 In this fourth edition of XYZ, we choose another natural space: the Ullals de Baltasar, a group of small lagoons, surrounded by small forests of eucalyptus, that between orchards and rice fields, form a fantastic landscape, very different from the other environments of the Delta. The Baltasar or Arispe Ullals are part of the Delta del Ebro Natural Park, located in the municipality of Amposta, next to the old Carles III navigation channel, between Amposta and San Carlos de la Rápita. They are freshwater springs that come from the nearby mountains of the Sierra del Montsiá and the Ports. The water makes a long journey through the interior of the earth to this point of the deltaic platform where it ascends creating these lagoons in a circular or eye. The uniqueness of this space is in its landscape and morphological features that make it almost magical. It also becomes symbolic because of the multiplicity of meanings and relationships that arise from its place name, Ullals: "sources as eyes." The eyes look and see, the earth as a living being, as a goddess who observes and watches, connects memory with that atavistic, ancestral thing that relates us to the origins, they are nexus between nature, thought and consciousness. The logic of XYZ is triggered by a call for artists working in these formats with an allocation of € 4,000 including taxes for the production of the winning project. The call is addressed to artists and creators resident in the Spanish State and is open until April 21, 2019. A jury formed by Nora Ancarola (artist), Juan Guardiola (Director of the CDAN) and Xavier Abril (Technician of the Delta del Ebro Natural Park) will choose the finalists, and the selected works will be involved with the public by popular vote. The winning intervention will be formalized in the Ullas de Balltasar during the second half of July 2019. You can download the bases in the link on the left.